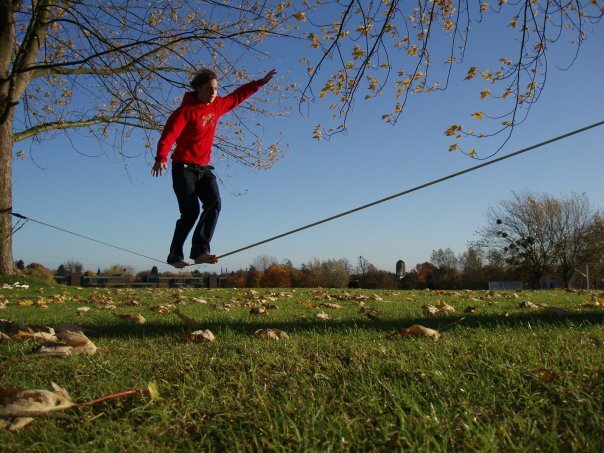 Slacklining is a practice in balance that typically uses nylon or polyester webbing tensioned between two anchor points. Many people suggest slacklining is distinct from tightrope walking in that the line is not held rigidly taut (although it is still under some tension); it is instead dynamic, stretching and bouncing like a long and narrow trampoline. The line’s tension can be adjusted to suit the user and different types of webbing can be used to achieve a variety of feats.